Every week until Christmas, we’re offering one fragrance bestseller at a very special, one-off price for the first 100 customers. All you have to do is add the product to your basket and check out using the voucher code FIRST100 – it’s that simple! 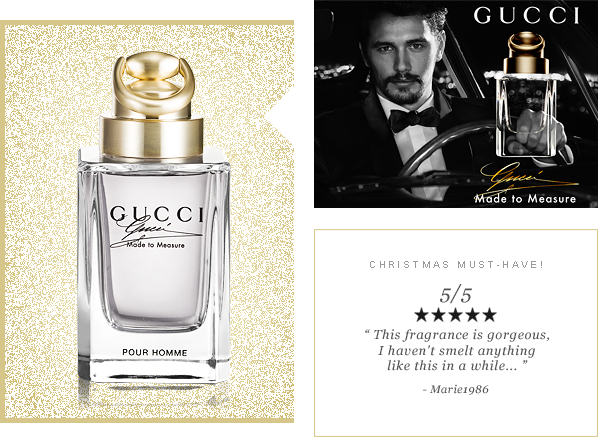 First up was the brand new fragrance Gucci Made to Measure, a suave and sophisticated scent inspired by the cut of a fine suit. This promotion is now finished! Keep an eye out for our other Christmas products of the week on Twitter and Facebook. James, Team Escentual: “A light and very pleasant scent, that does not overpower. The combination of notes gives the overall impression of a gentle ocean day. Once left to linger skin the spicier Bergamont and light floral notes are more prevalent without distracting from the overall ocean breeze effect of the fragrance. This entry was posted on Wednesday, November 13th, 2013 at 7:14 pm and is filed under Christmas, Fragrance, Offers, Tried & Tested. You can follow any responses to this entry through the RSS 2.0 feed. You can skip to the end and leave a response. Pinging is currently not allowed.